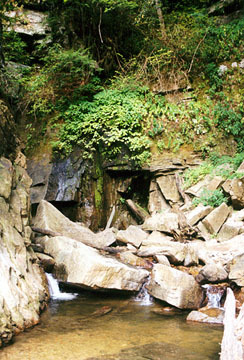 Laurel Fork Falls can be reach two ways, hard and easy. 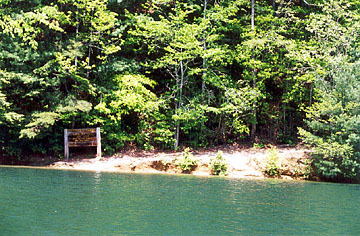 The easy way is by boat on Lake Jocassee. Here's the hard way: an 8.1-mile strenuous hike on the Foothills Trail with lots (and I mean lots) of wooden steps to climb as you ascend and descend. The 18in long x 6in deep x 4in high wooden steps are fixed to the trail with two 24in steel rebar rods, all courtesy of Duke Power. The trail begins across the road from the Laurel Valley Access parking lot. 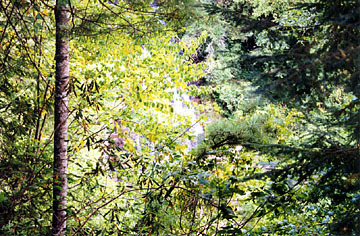 Hike the Foothills Trail (white blazes) for four to six hours up, around and down Flatrock Mountain and down along Laurel Fork Creek. Once you descend to Laurel Fork Creek, you are about halfway there. You'll cross the creek several times on substantial wood and wood/steel suspension bridges, again courtesy of Duke Power. 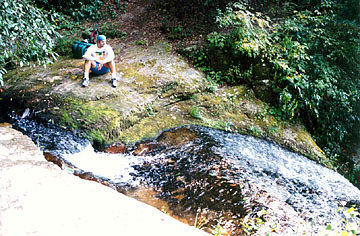 Once you reach a small bench, you are just above Double Falls at the 4.7-mile mark. Descend more steps on the trail and look for a footpath to the left that goes to the base of that falls. Take a lunch break. Pull out your water filter and refill your bottles. 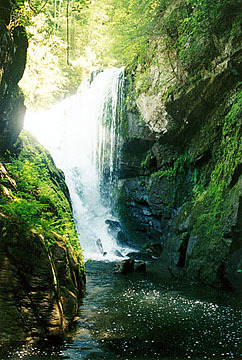 Take a nap, then hike a few more miles to reach Laurel Fork Falls. 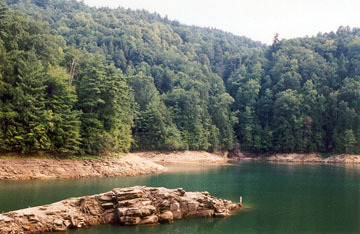 Laurel Fork, under normal waterflow conditions, spills directly into Lake Jocassee. 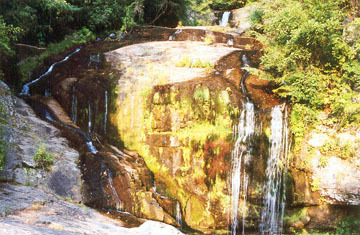 During August 2002, the water levels were down substantially and the waterfall was much harder to reach by land and by boat. To reach the level pictured above required a significant amount of scrambling around the steep shoreline of the lake. 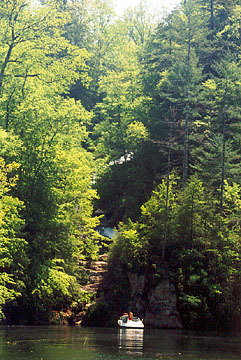 In the past, there was a good view of the upper level of the falls from the Foothills Trail. 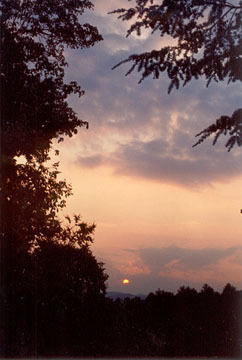 However, that overlook has obscured by plant growth (as seen in the picture below). 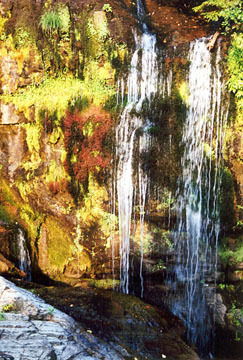 We finally got some significant rain during the 2002-2003 winter, and this waterfall was restored to its glory. The view above is via boat from the grotto where Laurel Creek spills into Lake Jocassee. 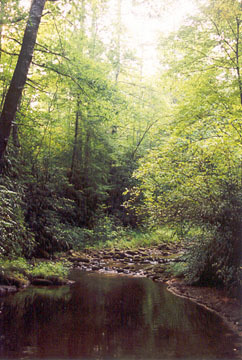 There is a spur trail from the Foothills Trail that crosses the creek and leads to several primitive camp sites near the top of Laurel Fork Falls. There's nothing like going to sleep to the sound of rushing water. But be careful, there have been a number of deaths and injuries at this fall. A memorial to one of those who died is at the top of the falls. 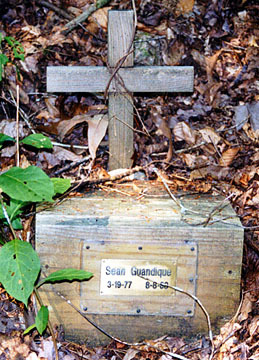 Marker reads: "Sean Guandique" "3-19-77" "8-8-88"
For more trail details, get a copy of "The Foothills Trail: A Comprehensive Guide" and/or a map of the Foothills Trail at a local outdoor outfitter or from the Foothills Trail Conference. Proceeds from the sales of the guidebook and map help pay for trail maintenance.